Whew, so here it is. 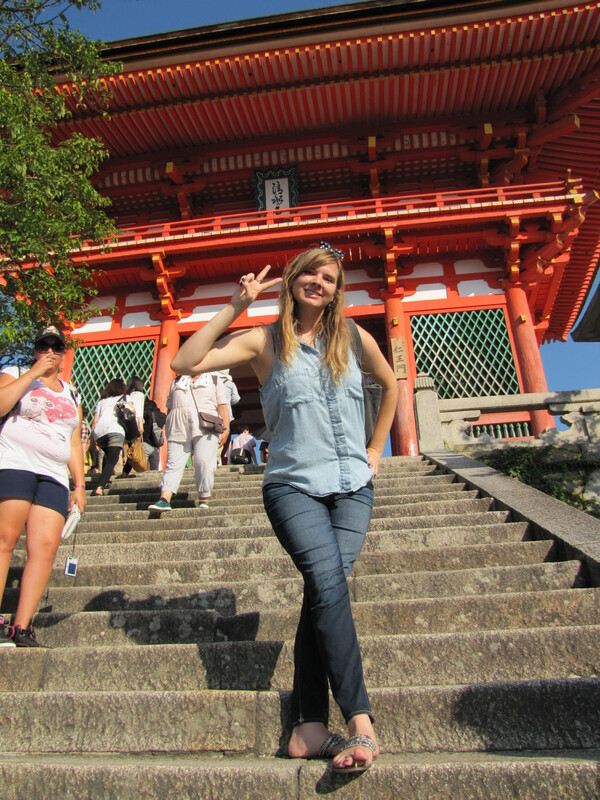 The long-awaited second Kyoto post. 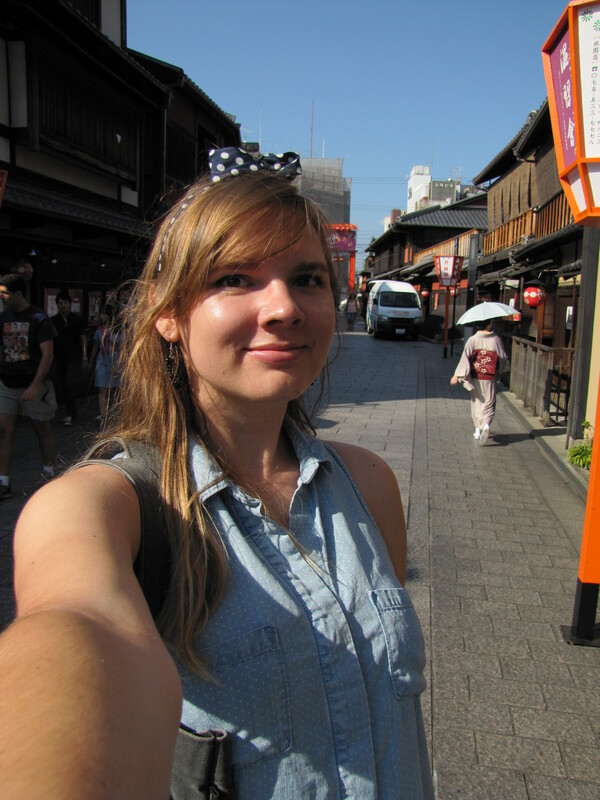 I have many other fun things to discuss, but first let me finish discussing our day trip to Kyoto.So, it took us some doing, figuring out our way around Kyoto. Even our Japanese friends weren’t totally sure how to get to the place that we wanted to go to, so we were walking around for a good half hour or so. 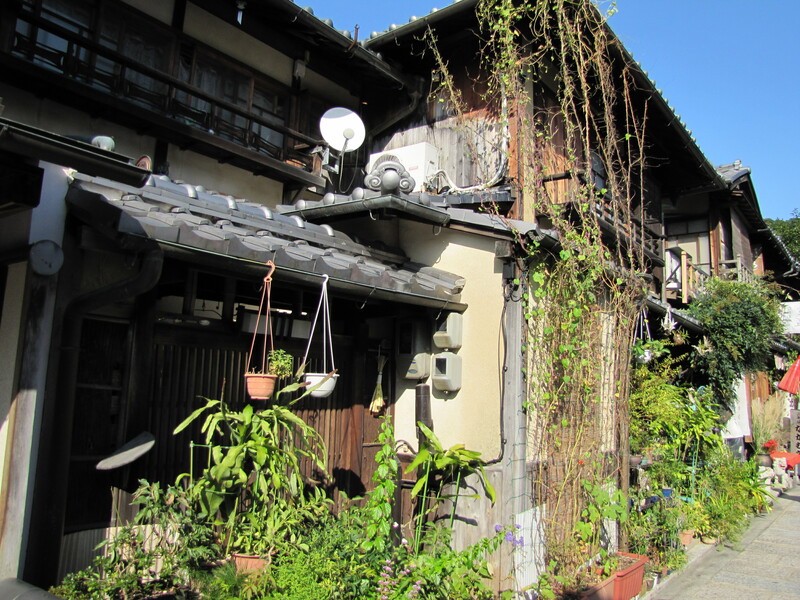 Finally, we came upon an area that looked like the sort of Gion I’d seen in pictures and imagined in my mind–traditional Japanese style streets and buildings with paper lanterns hanging around, inviting visitors in for a meal or a drink or a cup of tea. 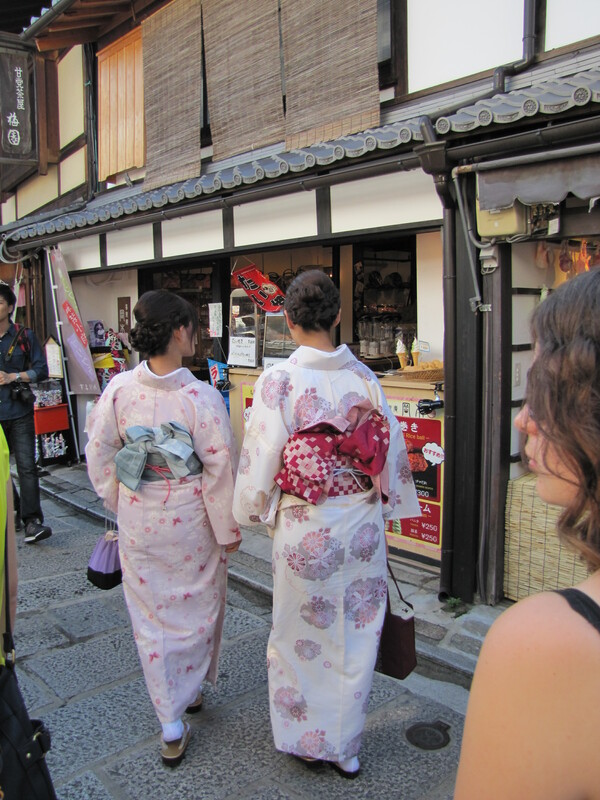 There were many women wearing kimono and at one point we were even passed by a taxi that appeared to have a geisha sitting in the backseat! Below is a photo I snapped of a couple posing for what I assume are wedding photos or a family portrait of some kind. After a certain point, you have to start climbing–it’s all uphill pathways and stairs. 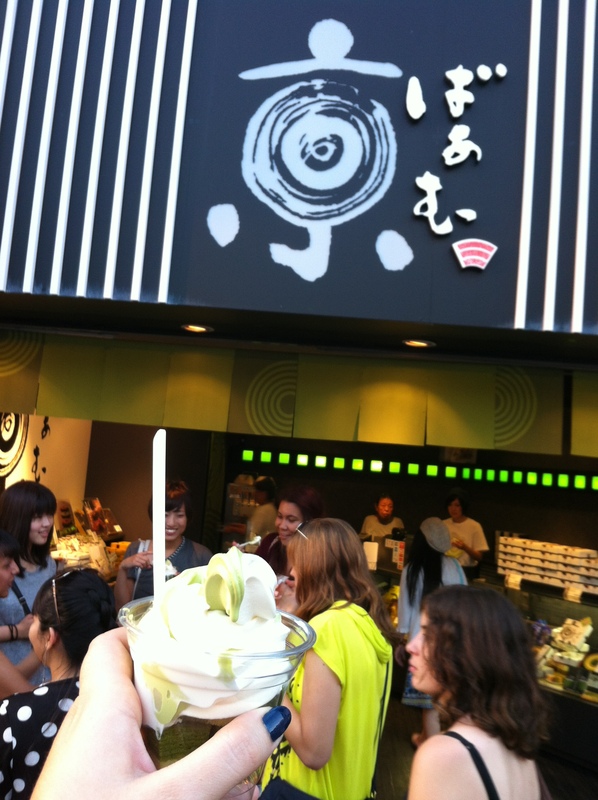 But the area is very beautiful and there are many interesting shops filled with teas and sweets and omiyage. 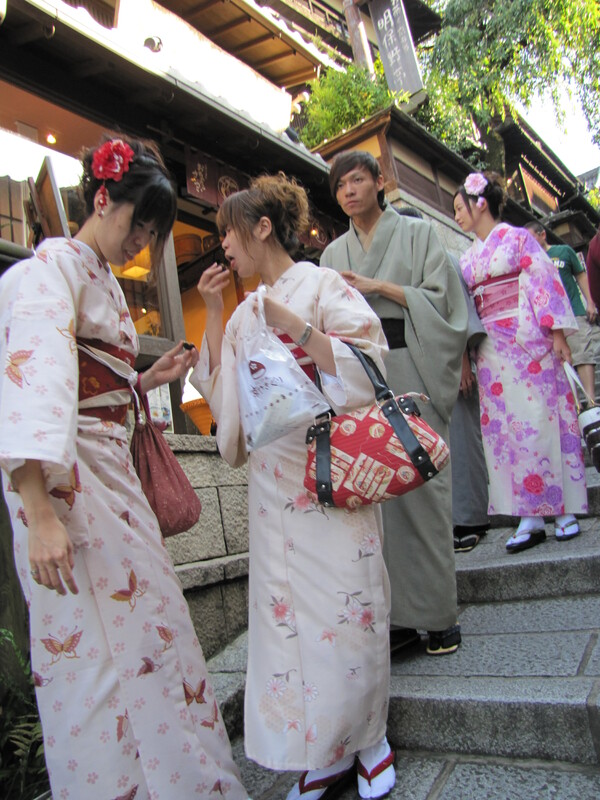 Also, like I mentioned, many people come here wearing traditional Japanese clothing. On another note, there is a Studio Ghibli store selling all sorts of cute goods. I bought a tiny stuffed Jiji cat (from the movie Kiki’s Delivery Service), as well as some small towel/hankerchiefs with a Jiji motif (for myself) and Totoro (as gifts for my friends.) 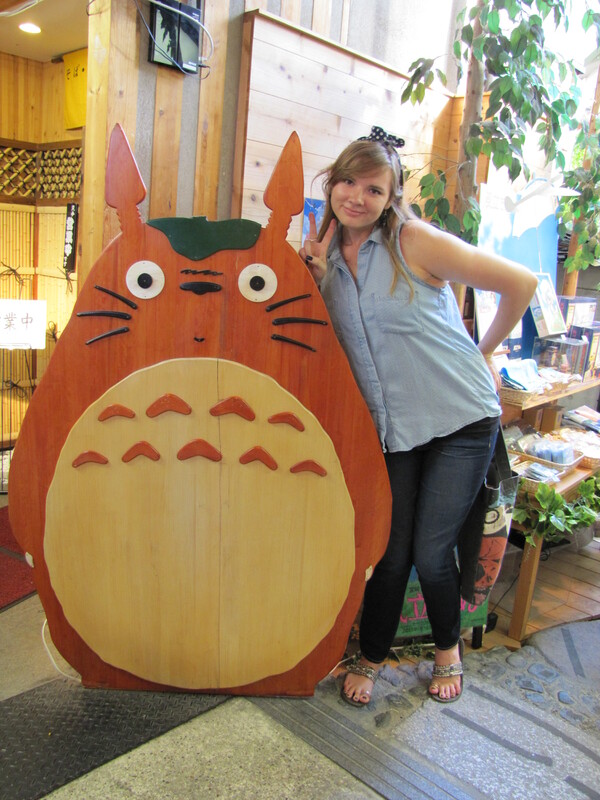 Below, I took a picture with the large wooden Totoro they have in the front of the store. Finally, we arrived at our destination. 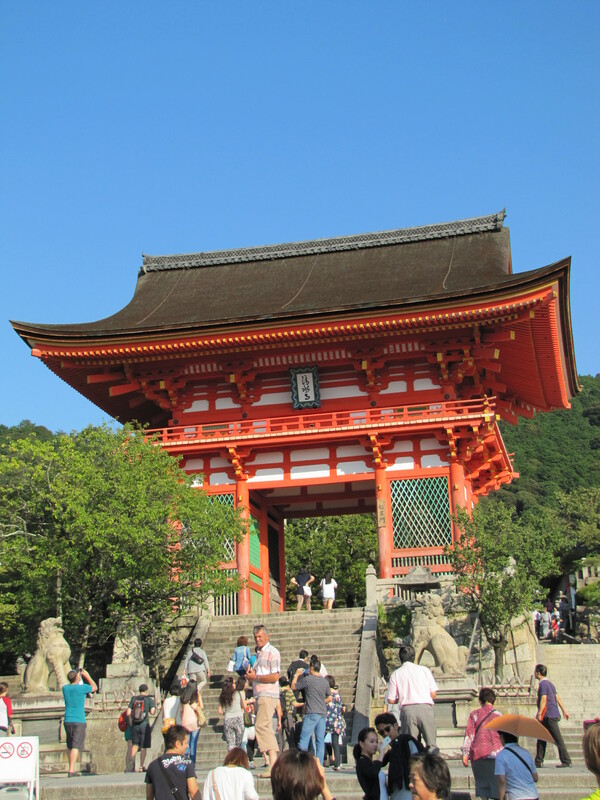 Kiyomizudera shrine. To be honest, I didn’t actually go inside because by then I was quite tired and there was a small entrance fee that I didn’t really want to pay. 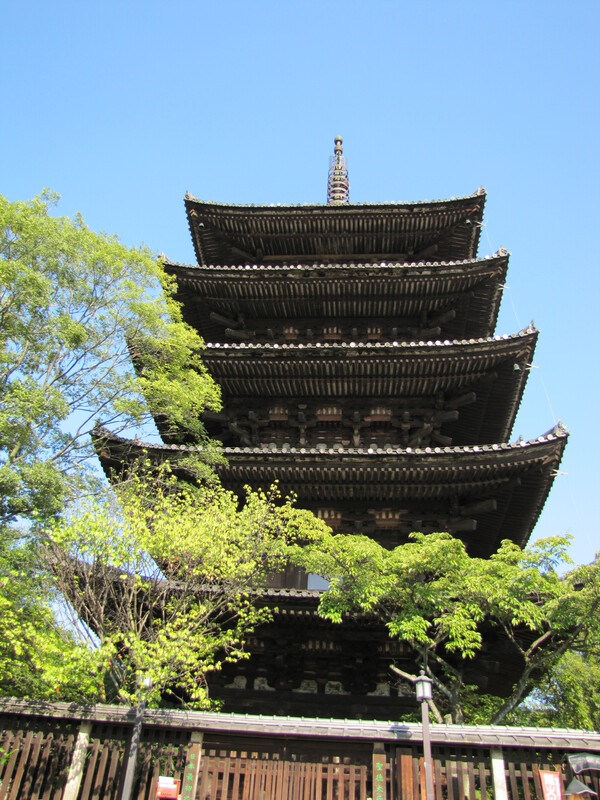 But that didn’t stop us from taking photos around the gate and pagoda at the entrance to the shrine! 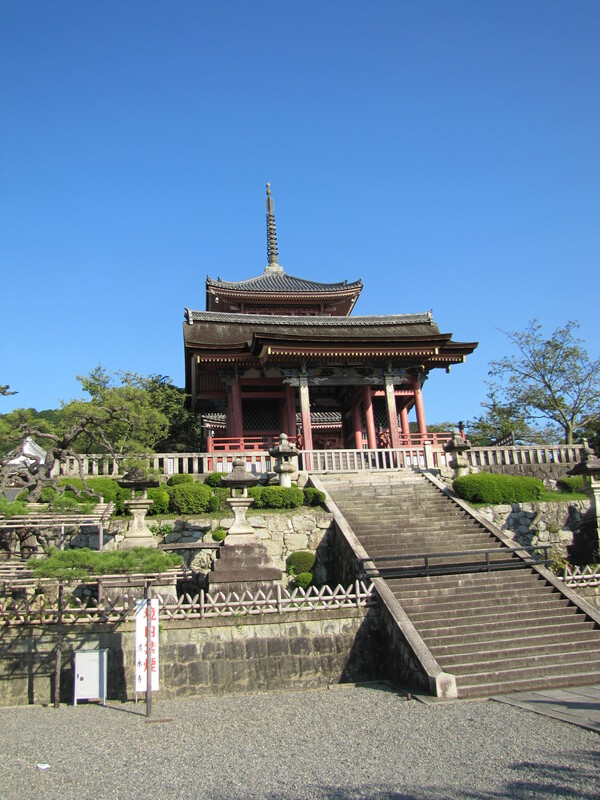 Some fun facts and history about the shrine: Kiyomizudera was founded in the Heian period, but it’s current structure was ordered to be built by Tokugawa Iemitsu in 1633. Not a single nail was used in the entire structure. 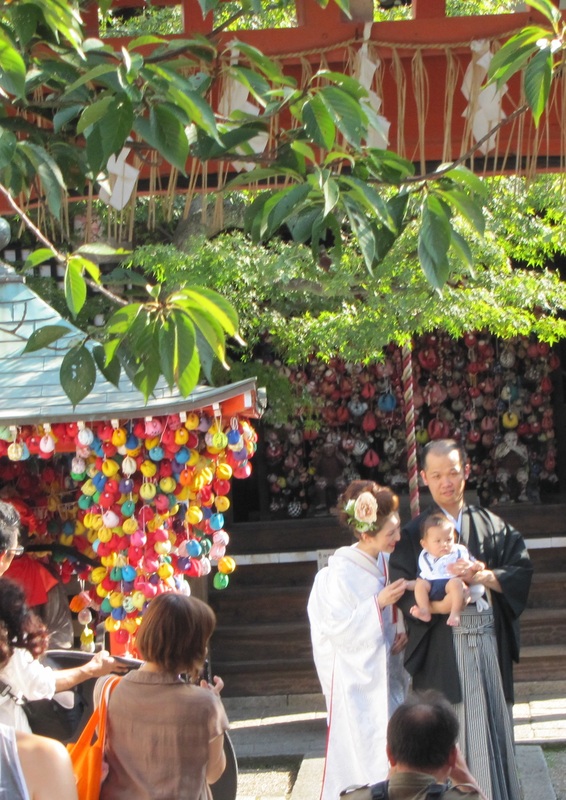 It was originally affiliated with the Hossou sect of Buddhism, but has since severed that affiliation and is now considered part of the Kitahossou sect. 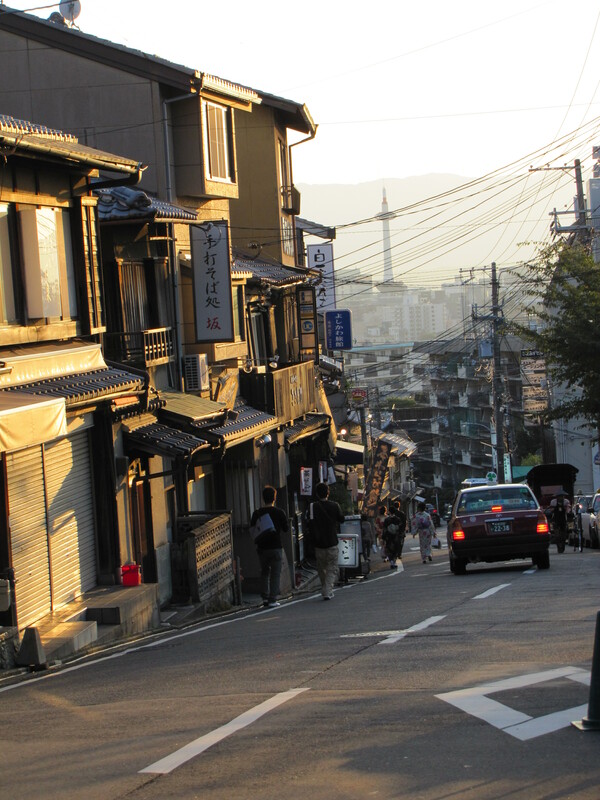 And so we make our way back down the hill while enjoying Kyoto’s sunset scenery. 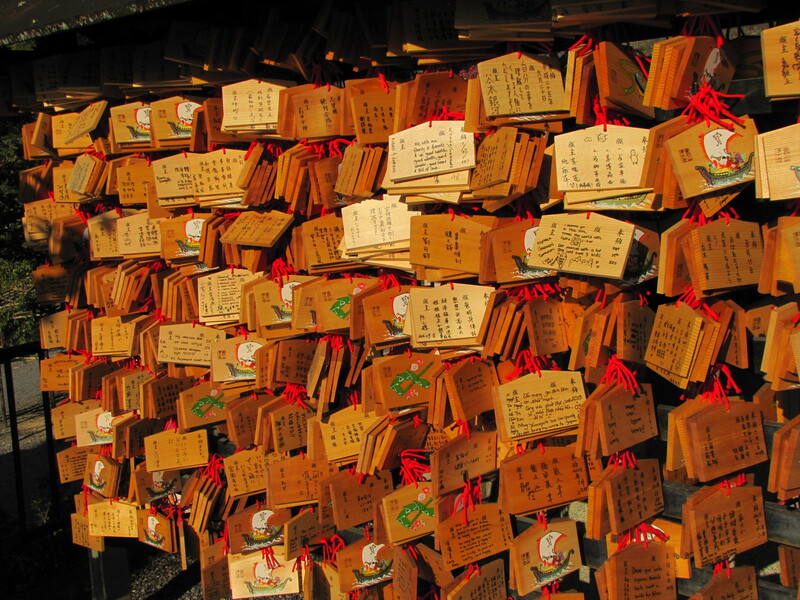 But there is one last thing I must impart to you… Kyobaamu Softo. 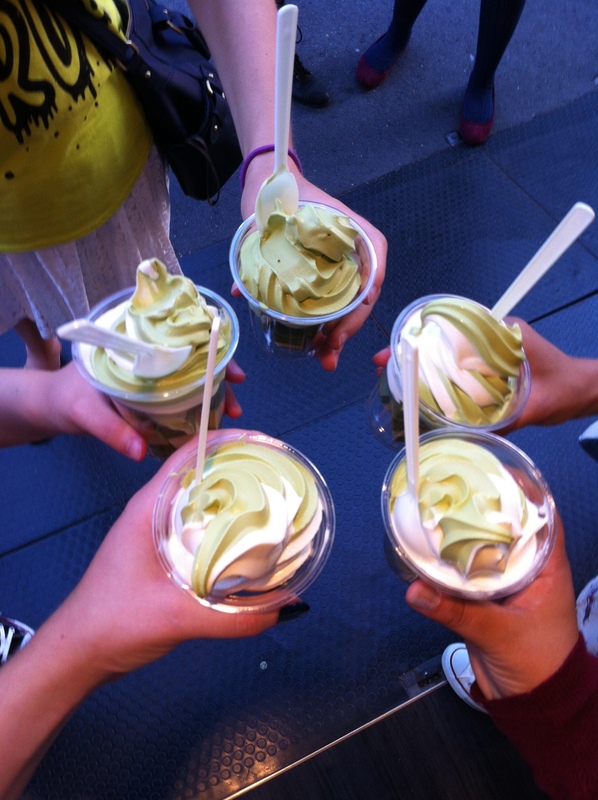 Basically, it’s soft serve ice cream over green tea cake. IT IS FABULOUS. If you ever get the chance to try it, I highly recommend it. And so ends our day out. We headed back to the station and had a long, long train ride waiting for us. 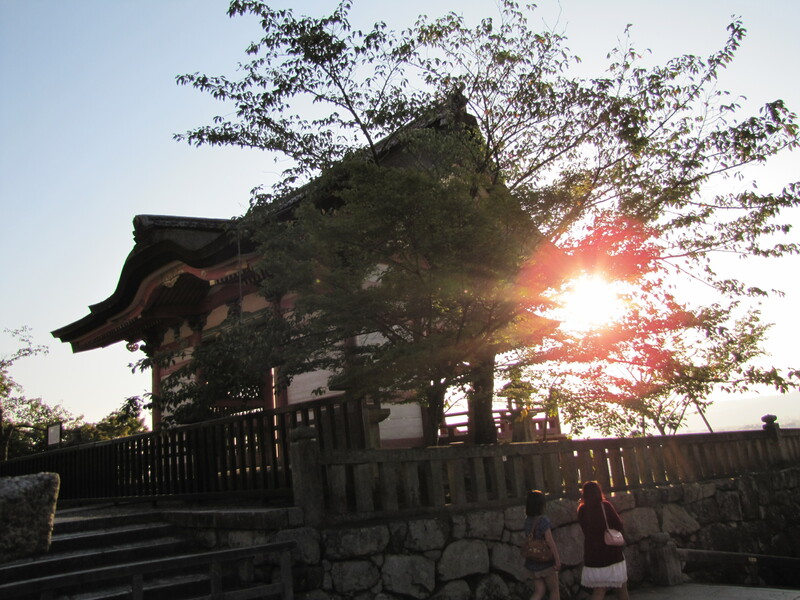 I haven’t been back to Kyoto yet, though there is much more I’d like to see, particularly during the autumn season. But it’s such a long train ride and I’m so busy, I don’t know when I’ll next have a chance. Well, on to the next adventure! 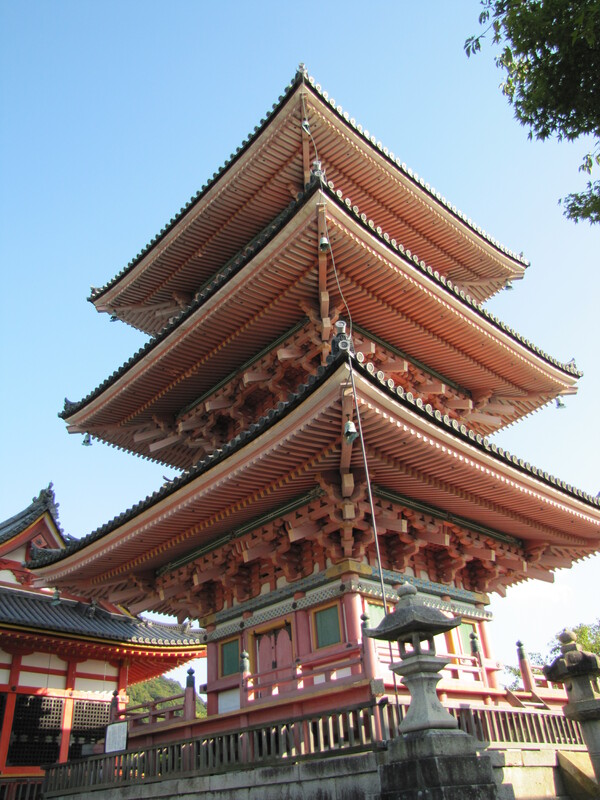 This entry was posted in Uncategorized and tagged Japan, Kiyomizudera, Kyoto. Bookmark the permalink. Thank you! And thanks for the info~! Yeah, I suspected a wedding, but since they seemed to already have a child, I was wondering if it was perhaps some other occasion, like a family photo or something.